Cultural changes and urbanisation have led to a shrinking market for the wooden handicrafts and a decline in the number of traditional toymakers. The mountains, river and lush green landscape lend a special charm to Chitrakoot, which means hills of many wonders. Chitrakoot is known for its wooden handicraft, toys in particular. Making of wooden handicraft is an age-old tradition in this small town, located in the border of Uttar Pradesh and Madhya Pradesh, about 280 km from Allahabad and 92 km from Satna. The jungles of Chitrakoot supply Dudhi Sundari and Koraiya woods, with which the handicrafts are made. The tapping, sawing and drilling sounds associated with woodwork that rang through the village has diminished much. Making and selling of the handicraft that sustained more than 200 families earlier lacks patronage now, due to urbanisation and better appeal of modern toys. The district, designated as backward by the Uttar Pradesh government, has reasonable employment opportunities for the educated since there are two government universities and a few schools. However, artisans’ livelihood has been affected due to fall in demand. As his fingers moved to and fro to carve the perfect shape of a bangle stand, 45-year-old Bhagvati Singh recounted the story of his grandfather who used to make 100 toys in a day. The artisans were able to sell their wares from small outlets in religious places and through exhibitions. With urbanisation, housing needs have led to lack of open spaces for craftsmen to set up temporary stalls during tourist season and festivals. They manage to sell the handicraft items through local exhibitions for their livelihood. The craftsmen find no market or demand for handmade wooden toys nowadays. 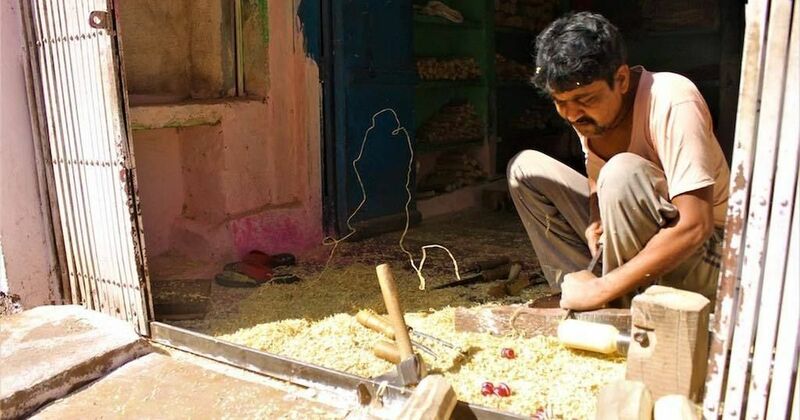 “My art and passion for toy making are not enough to sustain my family,” Gorelal Rajput, a craftsperson with state and national awards to his credit, told VillageSquare.in. From 200-odd families making and selling Chitrakoot toys and handicraft, the number of families who depend solely on this art form to sustain themselves has come down to about 30. Bhagvati’s father Bihari Singh was also a well-known craftsperson. Thakurs and Brahmins who generally practice the art form pass it down through generations. Traditionally, the entire family, including the women, participated in the making of the wooden handicrafts. “My mother and aunts would finish their chores and join the men to lend a hand,” Bhagvati said. Impressed by what he observed, Bhagvati learnt the intricacies of crafting toys from his father and took it up as his vocation. He understands that lifestyles and mindset of the younger generation have changed. “I don’t want my children to live the life I do,” he said. Watching Bhagvati struggle to earn a reasonable income, his three wards are not willing to carry the tradition forward. According to them, Chitrakoot toys are a good-for-nothing craft. Raja, the elder son, is pursuing his bachelor’s degree in electronic engineering. He looks forward to moving to a city for better job opportunities. Gorelal’s family members are supportive and proud of what he does. 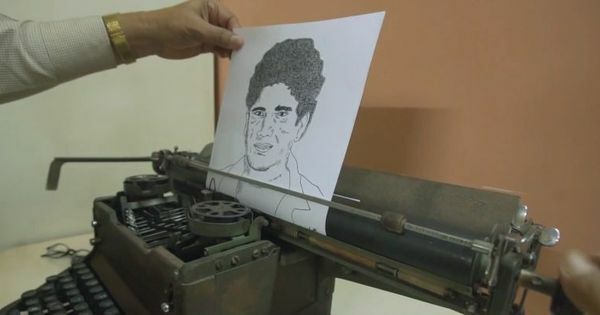 However, his children do not want to continue with the toy- making tradition, since they feel that they can take up other jobs that would give them better and sustained income. The craftsmen said that the government provides them wood only once a year at the subsidised rate of Rs 500 per quintal. This quantity does not suffice the annual need. They do not buy the stock for an entire year because of lack of funds and lack of storage space. The wood they get is raw, with just the external bark removed. The artisans have to carry out the entire process of peeling the hard layers off and filing the wood to make it ready for carving. Filing releases a lot of tiny particles in the atmosphere that may cause respiratory problems. Once they run out of the wood supplied by the government, they buy from private dealers who supply sawed sticks at Rs 50 per stick. The craftsmen make up to four small toys from one stick. Facilities for craftsmen to showcase and sell their completed products are also limited. Various towns in Uttar Pradesh including Mirzapur, Saharanpur, Bijnor and Varanasi have traditional craftsmen making wooden handicraft. However, Chitrakoot artisans have always considered their wooden handicraft as a prime art form, taking pride in making them. Known for its mythological importance from the time of Ramayana, Chitrakoot is an important pilgrimage and tourism hub. The craftsmen hope to continue selling their handiwork from temporary stalls during festivals. Gorelal conveyed apprehensions about the future of the tradition since the children of the present-day craftsmen are not keen to take it up and they lack government support. “If there are training centres, I’m sure people would join and save the craft from dying,” he said. Gorelal’s pride in his craft was obvious when he showed his warehouse full of wooden idols, bangle stands, lattoos or spinning tops, key rings and other toys. He and his fellow craftsmen who have held on to the traditional art form are hopeful that they would be able to cope with changing market trends. No matter how bad the situation turns, they said they would cherish and continue the tradition.